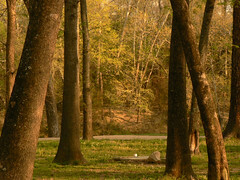 Explore Greenleaf Lake and the Arkansas Waterway to search for wintering waterfowl and eagles. Tours will depart from the Nature Hut at 8am and 1pm. Admission is free! This time of year, many Oklahoma kayakers start seeking more southern destinations for their paddling adventures. 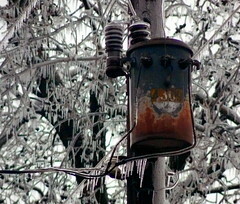 Southern climates tend to be warmer as winter settles in on my part of Oklahoma. Even today's forecast calls for Okmulgee to slog through a misty 50 degree day while Broken Bow, Oklahoma is expecting to enjoy a 73 degree day of warm winter sun. Oklahoma's new Flatwater Paddlers Group is discussing some cold water paddling trips. So far, the suggested sites include Caddo Lake in Texas and maybe even a three day trip to Lafayette, Louisiana. Both sound like great trips to me. I have long wanted to visit Lousiana and I have been planning on making a trip to Caddo Lake for awhile now. I even went as far as starting a Texas Kayaking Page listing canoe and kayak rentals, cabins and the Texas paddling spots I long to visit. Caddo Lake sits on the Texas and Louisiana border in North East Texas and North West Louisiana. The Cypress tree thickets and Spanish Moss on Caddo Lake make it very different from the lakes here in Northeastern Oklahoma. It sounds perfect for some Kayak Photography. 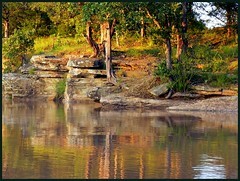 Another spot that I have been considering is Long Lake Resort in Poteau, Oklahoma. I still need to give them a call and find out what their policies are on allowing kayaking on their two private lakes. The two private lakes, Long Lake and Terrell Lake, are natural lakes stocked with fish. Each lake is approximately 45 to 50 acres in size and the cabins (some with a jacuzzi) are apparently right by the water. It sounds like some nice sheltered water nestled in the beautiful Ouachita Mountains. If you have paddled these areas or have some other southern paddling destination to suggest...leave us a comment on the blog! Of course another winter paddlers option is taking some small pleasure from Kayaking Books like this Texas Paddling Guide: Paddling the Wild Neches (Texas A&M Nature Guides) of course paddling books are only cold comfort and can't compare to actually getting out there! I mentioned yesterday that the Deep Fork River bridge near Nuyaka Creek Winery is a pretty good place to put-in for some flatwater kayaking that muddy old river. What I forgot to mention was that there is a particularly good opportunity for visiting the winery coming up this month. Mom & Dad will be hosting a Christmas Open House on Thursday, December 20, 2007 from Noon until 6:00 PM. Free home cooking AND Oklahoma wine tasting for all! 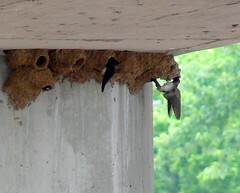 You can also see the new underground facility Dad has been working on. The Deep Fork River is an Oklahoma tributary of the North Canadian River. It flows from Oklahoma City and meets the North Canadian River at Lake Eufaula about 200 miles away. It has taken me quite awhile, but I have begun to see more and more glimpses of the beauty that this river hides so well. At first, I could see nothing at all to love in the almost monochrome redness of the river. However, in time I started to find the gnarled trees, twisted roots and sinister looking logjams as a secret source of dark beauty. 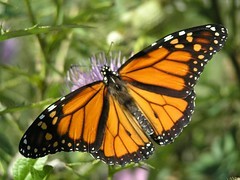 It only exposes its sweetest attributes during the magical few hours just after sunrise and just before dawn. Many Oklahoma Rivers seem prudish in the very same way. Former Arkansas Governor, and current presidential candidate, Mike Huckabee spent years fighting attempts by Oklahoma to institute stricter pollution controls to protect their waterways. Huckabee opposed efforts to reduce the amount of phosphorous in the Illinois River that threatened fish populations, changed the color of the water and caused foul taste and odor. Huckabee thinks that any Okie seeking to protect the Illinois River is suffering from a 'Crazed Obsession'. I hope that Oklahoma voters have the sense to recognize that placing a common shill for Big Business in the White House will only lead to a river of crap for Oklahoma. Ok, attaching a trolling motor to power small craft like canoes and kayaks is nothing new. In fact, we have a small bayou canoe fitted with a little Minn Kota for boating on lazy days. Nonetheless, I was shocked to see this: a solar powered, trolling motor driven outrigger kayak! The outrigger attachment, including the frame, motor, waterproofed battery in the flotation pod compartment, and solar cells with a 120-volt charger retails for a pricey $1100. Kayak sold separately. The Oklahoma City Boathouse Foundation is sponsoring the formation of a new kayak Venturing Crew for young men and women ages 14-20. Venturing is a coed youth development program affiliated with the Boy Scouts of America. The program focuses on giving youth the opportunity to explore special interests while encouraging personal growth and leadership skills. A kayak Venturing Crew open house will be held Saturday, November 10, 11 am to 1pm, at the Chesapeake Boathouse, 725 S. Lincoln Blvd. The open house will give youth the opportunity to learn about Venturing Crew and meet kayakers who will compete in the 2008 Olympics in Beijing. Parents who are interested in volunteering their time for the kayaking Venture Crew are encouraged to attend. Weather permitting, kayaking will be available to the youth; waivers must be signed by parents of those under the age of 18. The Venturing Crew will be lead by the youth with adult advisors. The crew will have the opportunity to learn about recreational, whitewater, and race kayaking. 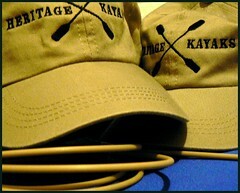 Annual cost for membership in the kayak Venturing Crew is $10. For more information, contact Matthew Woodson, coordinator, at (405) 370-9543. There are fliers here: OKC Kayak Venturing (PDF), please distribute them. 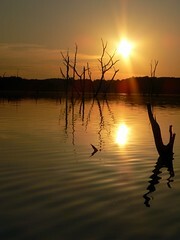 Last week Al emailed me about a lake near Sapulpa, Oklahoma called Sahoma Lake. He thought it looked like it might make a good spot for some group paddling trips. Since Sapulpa is about 45 minutes from my house, I think he may be right! Greg was looking for a new spot to fish, so we decided to make a road trip to Sapulpa. Just two and a half miles from downtown Sapulpa is a large, well equipped recreation area on two small lakes. The larger of the two is Sahoma Lake and it covers about 340 acres. Sahoma is an excellent kayaker lake for a number of reasons and a bit of a bummer for one reason. Sapulpa doesn't allow any jet ski or ski boats on either lake, so the only wakes you have to deal with are the ones created by our Oklahoma wind. Sahoma offers RV spaces, tent camping, a heated fishing dock, well equipped picnic areas, restrooms and great little bait store with food, drinks, information, permits and more! Unfortunately, both lakes require boaters to buy local fishing permits (available at the bait shop). I don't like the hassle of local permits, but it is nice to know that they are using the permit money to stock trout, catfish and hybrid panfish in both lakes. 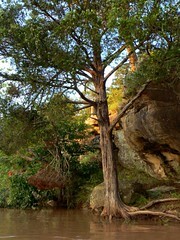 We didn't find time to paddle Sapulpa's other, smaller lake but I bought a Family Permit so I know we will be back. Pretty Water Lake is well named and apparently they mean to keep the water pretty, because the rule is: No Gas Engines on Pretty Water Lake. 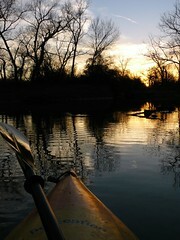 Flatwater Paddling AND Trout Fishing Near Tulsa! The City of Sapulpa stocks Pretty Water Lake twice a month from October through March with Rainbow and Golden Trout. The rest of the year they stock the lake with Channel Catfish and Hybrid Panfish. Naturally, there are good numbers of bass, turtles, cranes, ducks and other wildlife to enjoy at both lakes. Since Pretty Water Lake spills over into Sahoma Lake (see photo above), both lakes get stocked with some great game fish. Sapulpa has developed two excellent flatwater resources for Oklahoma paddlers and kayak fishing enthusiasts, both within striking distance of Tulsa. 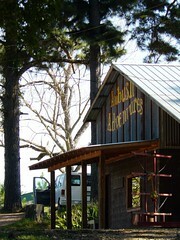 Don't be the last to discover these two gems right off Old Highway 75. 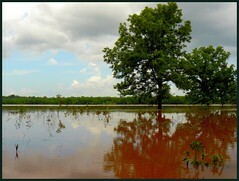 More Photos of Sahoma Lake & Pretty Water Lake in Sapulpa. Got any stories of paddling or fishing this area? We would love to hear about it. Just drop us comment on the Oklahoma Road Trips Blog, anytime! "...a member-run group dedicated to those interested in canoing and kayaking the gentler rivers and other bodies of water NOT categorized as extreme whitewater. The group has no membership fees and the only requirement is that you occasionally leave the comfort of your sofa and join others in the enjoyment of outdoor paddling. It's a great way to grow social contacts and have some outdoor fun at the same time. In addition, the group will serve as a source of shared information to help build skills and coordinate activities. Most importantly of all, this is YOUR group. 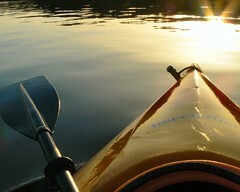 Join in and help promote RECREATIONAL paddling in our area." 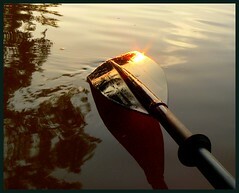 ... or search for Flatwater Paddlers Oklahoma on Yahoo Groups. Yesterday after work the weather was so mild, I just had to get the kayak wet. I've been paddling at Dripping Springs Lake quite a bit lately because it is so close to my home but the wind has made the water choppy. Since my Dad had been suggesting I try paddling Salt Creek for quite sometime, I decided to give it a try. 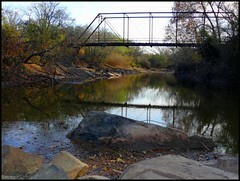 Salt Creek is a deep and narrow creek that runs between Okmulgee's two lakes. There is a nice parking spot and an excellent kayak launch spot right across the road from the Dripping Springs Lake Dam. 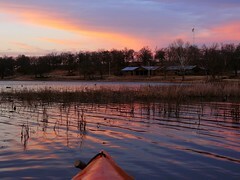 I paddled from the put-in down to where Salt Creek merges with Lake Okmulgee and then back. I didn't have a GPS but it felt like about 3 miles total. Naturally, there was plenty more water left for paddling, but I wanted to hurry back to the put-in to catch some pictures of the sunset. I think it was worth it. 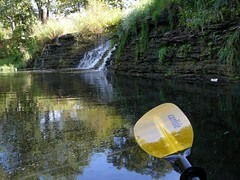 In my humble opinion, Salt Creek offers the best flatwater, no-current, paddling in Okmulgee County. Salt Creek offers plenty of shade, still waters on a windy day, herons, osprey and other waterfowl all in a long no-wake zone far from the boat racers and jet ski hazards of Lake Okmulgee. Other advantages include plentiful camping and RV facilities at Dripping Springs Lake and Lake Okmulgee and a well paved road that leads to the put-in. Expect to see plenty of beautiful whitetail deer on the road at twilight. 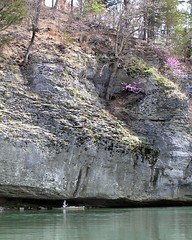 A great spot to canoe or kayak that is just a few miles from my house. In my book, that is a discovery that rivals Columbus! 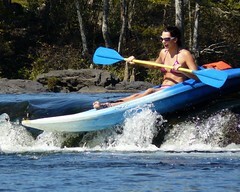 Evan, from The Red Dirt Paddlers, is trying to sell his dagger outlaw kayak. He would also be willing to trade it for a recreational kayak. If you are interested in learning more about The Red Dirt Paddlers, Oklahoma's own chapter of the ACC, visit the Red Dirt Paddlers page on the ACC website. 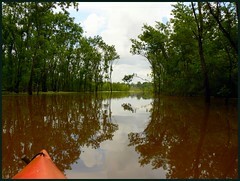 Last week I got an email from a blog reader in Checotah with an idea for a paddling trip. Greg, a kayak paddler who lives near our lot at Dogwood Acres, suggested we paddle from our lot, down the North Canadian River and across Eufaula Lake to the Jack Frisbee boat ramp. Normally, Dianne and I have to take 'up-and-back-again' trips on the river because we only have one vehicle and no shuttle. Needless to say, we were thrilled to get a chance to do a 'one-way', downriver trip and to meet one of our new neighbors. The float trip is about 6 miles, most of it with a decent downstream current. We started early in the morning to try and beat the heat. This is pretty important for taking this particular trip during the summer. Although the river portion of the trip offers some current and quite a bit of shade, the last leg of the trip is pure Lake Paddling in the blazing sun. One of the downsides of paddling Oklahoma lakes is that the wide open area offers little shade. Also, the lack of distance cues around you makes it seem like you are paddling at an a very slow speed. 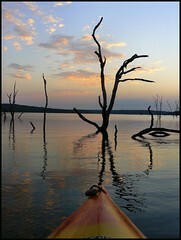 The feeling of slowness makes paddling across many Oklahoma lakes feel very monotonous. There is also an element of danger when paddling your kayak across a big expanse of water where ski boats and personal watercraft race around at breakneck speeds. Despite a couple miles of paddling across the lake at the end, the trip is a good one. Although not as scenic as the Illinois River or the Lower Mountain Fork River, paddling the North Canadian offers solitude, peacefulness and some cool bird watching opportunities. Meeting Greg was the best part of the trip. He is a really conscientious paddler and all-around nice guy who has developed some very good safety habits. Dianne and I set the bar rather low when it comes to safety procedures. We wear our PFD's when paddling, but that is about the extent of our safety preparations. Greg plotted the whole trip out on a map and brought along some rescue gear in case someone ran into trouble. His kayak is a cool Advanced Elements boat about ten feet long, some folks call them Folding Kayaks. Advanced Elements makes hybrid kayaks that have the buoyancy of an inflatable kayak with a rigid frame that makes it easier to paddle than most pure inflatable boats. The best feature of the boat is that is can be carried on a roof rack like a regular kayak OR you can take it down and fold it into a bag for traveling! 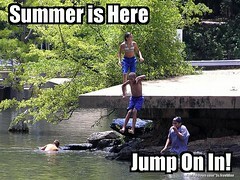 The trip running from Dogwood Acres to Jack Frisbee Boat Ramp near No Name Creek will be one I am sure we will repeat. The Frisbee Baot Ramp is right of Highway 150 and offers a great parking area that is close to food, lodging, bait...whatever you need. Greg offered two suggestions on the trip that I ignored and looking back on it...I should have taken his advice. The first was when he offered us all sunscreen at about 9:30am and the second was when he suggested a group picture at the end. Buddy, you were right! This felt like our first real float trip of the summer because it isn't a real float trip until someone (me) gets a sunburn on their knees, right? Greg, if you are reading this…thanks for a great trip! 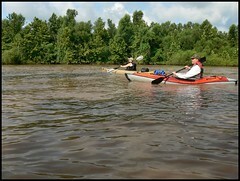 Dianne and I really enjoyed it meeting a fellow paddler that knows the Eufaula area so well. 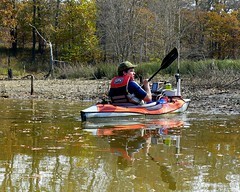 Greg, a Checotah area reader of my little Oklahoma kayaking blog, has suggested paddling from our river lot near Pierce, Oklahoma downriver to the Jack Frisbee Boat Ramp on Eufaula Lake just off Hwy 150. It sounds like an excellent trip, well worth repeating if everything works out. There is an excellent boat ramp and paved parking area at the landing site, plus ice, grub, bait and beverages just a couple miles up the road. The river level on the North Canadian River is still quite high, but that just improves the river access at our lot. 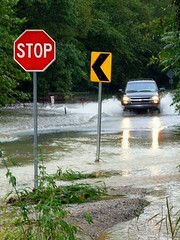 The current is also very high, so we will be watching out for debris coming down river. It will be nice to take a one-way paddle with the current for a change! The water level on the Illinois River still looks excellent with no flooding at all. 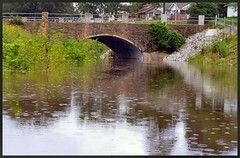 All of the rain Oklahoma has been seeing this summer has swollen most rivers to well beyond their banks. The bright side is that the numbers of frogs and wading birds are much larger this year than I have ever seen before. This weekend the water flow down our little section of the North Canadian River slowed down enough for me to do some solo paddling. I even managed a side trip to DFWR on Sunday. The North Canadian River is still very high, which is great for us because our river access spot normally has a steep bank making landing and launching very difficult. However, at it's current level it is a perfect spot to launch out and catch the sunrise or sunset. Landing is also a breeze due to some sandstone we recently arranged. 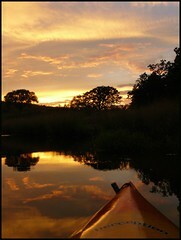 Saturday, after the lawn work, I paddled out around 7pm, just in time to catch some fantastic light. The tree photo here is basically right out of the camera. 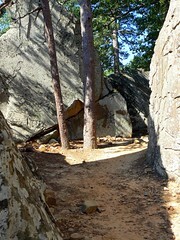 I got some nice pictures of the rocks as well. So many big catfish were rolling to make me wish I had brought a fishing rod. 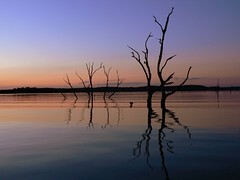 The recent strange weather has made for some very nice sunsets and it is easy to find water these days. Sunday, I met up with Bill at DFWR White Oak Area where the water is dropping pretty fast. Bill is a real nice local guy who saw some of our pictures on Flickr and we got to chatting about kayaks, photography and stuff. 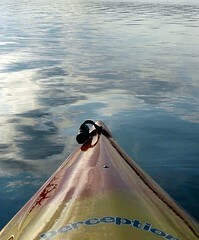 He took my Perception Swifty out into Thousand Acre Lake for a test paddle. He takes some killer shots with his Nikon D80 . I gotta get me one of those! The Illinois River is at ideal paddling depth so I am trying to get Dianne to agree on a weekend trip up that way. I am hoping to find some overnight lodging that would allow us to get on the water early enough to catch the good light.